In one of the stories of the late genius science fiction writer Robert Sheckley, the main character needs crazy and exotic items to cast a spell. Bat wings, eyes of newt, etc, etc. Seemingly hard to find items, yet the character did not have any problems finding them. Why? Because he lived in Manhattan. You can find the most obscure, impossible to locate items in New York. Dried parasitic fungus that feeds on caterpillars? I had no trouble finding it. A couple of days ago I made a happy discovery. It looks like Manhattan has it’s own chain of authentic Japanese “konbini” – convenience stores. When I visited Japan, I really liked konbinis. 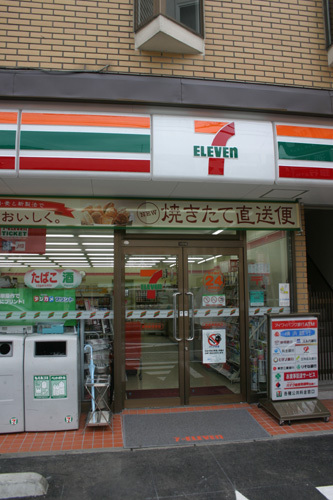 They have 7-Eleven, just like we do, but also Ministop, Lawson, Sunkus and FamilyMart. So, what’s different in a Japanese konbini? The variety and quality of junk food that they sell is a lot better. They are stocked with a humongous variety of snacks. Dozens of types of dried squid and fish for beer, Japanese sweets, nuts, edamame, sashimi quality fish, japanese pickles like umeboshi. The variety of soft drinks and genki drinks. They also have Japanese shampoos and skincare products. In short, they are stuffed with Japanese goodness of overpowering variety. I’ve been to SAM BOK store at 127 West 43rd Street before. It was nice but not the same as the real Japanese kombini. Also there’s a big Chinese supermarket in my are which has a lot of Japanese stuff. Not the same either. But then I found JAS MART. It even has 3 locations! They even have genki drinks and Coffee Boss coffe! I’ve been to the one on 23rd street and promptly loaded myself up with goodies. Unagi eel, unagi sauce, roasted rice tea, sencha tea, several types of dried ika and fish, umeboshi, edamame. It’s a little expensive, but hey – beats buying tickets to Japan. 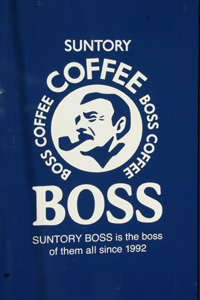 Coffee Boss is a brand of Japanese canned coffee drinks with a J. R. “Bob” Dobbs-look alike mascot. They are sold in Japanese style soda machines which look rather different from the US Coke/Pepsi machines. They can serve the cans hot or cold. I wonder why somebody doesn’t bring some of these to Manhattan – it looks like the design of soda machines hasn’t changed much in the last 20 years! 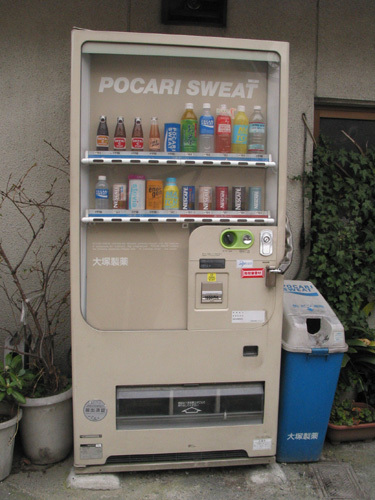 Pocari Sweat is a brand of Japanese sports drink, and despite the name rather tasty I might add. Notice the recycling can next to the machine – apparently the Japanese etiquette requires you to finish drinking your soft drinks next to the machine and not walking around with them. Almost every machine sold unsweetened green tea, in many cases Coke or Pepsi-branded.